Following this tutorial: http://im.snibgo.com/coffmug.htm the final mug image ithat I'm getting is incorrect - upper part of "painted" artwork is distorted. All of the intermediate image files seems to be correct, if compared to one in the article. I've only changed chequer pattern to white floor in cm_scene.pov. I'm using ImageMagick-7.0.7-22. Notice single color bar on top. Is this correct? Original snibgo logo/text gets distorted too, I've used different artwork file to make distortion more visible. I'm quite sure the article was written with older version of IM. where cm_i_disp_w.png is an empty 1199x399 image. Are my displacement map files correct? What's causing artwork distortion ? What is your IM version and platform/OS? Please always provide that. If using a Unix-like system, see my scripts, cylinderize and cylinderwarp at my link below. On my page, there isn't enough emphasis on precision. (I will add this.) The displacement maps should be at least 16 bits/channel/pixel. Your cm_3.png is only 8 bits/channel/pixel, so the displacement file is only 8 b/c/p. This means there are only 256 possible values for the horizontal displacement, and you need 1200, so you get a blocky result. I have added "+depth" to the command above. If you are using IM Q16 or better, this gives the required precision. The result looks good to me. I haven't tested the commands with IM v7. Incidentally, I have added a page showing the equivalent steps with Blender instead of POV-ray, on a tee-shirt instead of a coffee mug: Painting people. 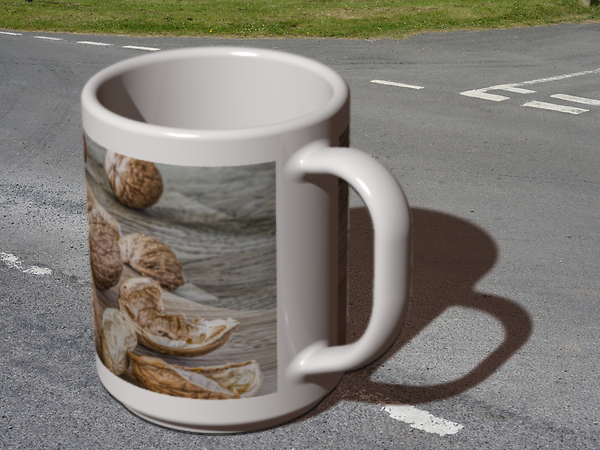 I have now tested the Coffee Mug page with IM v7.0.3-5. There is a problem with cm_mug_shad_wh.png, because v7 thinks the mean value "%[fx:mean*100]" of sRGB(57%,55%,54%) is 41.3%. I suppose this is a v7 bug, probably corrected in more recent versions. There is a problem with cm_base.png, not helped by me forgetting to double the "%" in "-sigmoidal-contrast 5,50%". After correcting that, v7 gives a wrong result from "-auto-level". Again, perhaps this has since been fixed.